This is an expression you will hear a lot from experienced traceurs it has a million different applications and facets which help traceurs to remain positive in times when they are struggling, maybe with weather, not being able to find spots, being short of time, or injury. I want to talk a little about injury and a couple of other ‘negative’ aspects of our discipline and how we can turn these into contributions towards training and progress. Failure, wether it be getting injured or just simply not performing a technique perfectly can be used to empower you and enhance your training. Every mistake or injury helps not only to highlight weaknesses in your training, but can also give you a new outlook and new perspective on how to approach training. 1)Using your mistakes to look more thoroughly at techniques and their incremental stages. 2)Using your mistakes to divert attention to other areas of training. 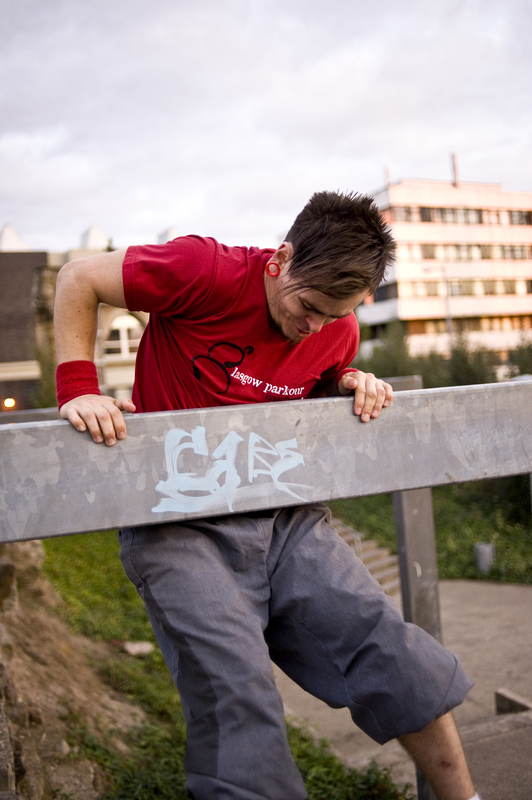 When most people start Parkour at some point they will simply jump to a rail and see what happens. Chances are you will land middle of your feet at best and fall off, or miss your feet and get hurt. Hopefully you have been sensible enough to try the movement somewhere at ground level. This mistake should help you to look at how to improve your technique and break it down. For a rail precision you need to practice, the balance for the landing, the jump technique for accuracy, the jump distance, strength to take the impact and core strength to keep your balance. This simple little mistake allows you to look at every aspect of the movement, and now you have a big list of things to train. Many positives come out of this one failure, instead of simply being annoyed at not being able to do something. So when you are finally ready to get practicing these precisions, clearly you are not going to land perfectly every time, so how do you turn those imbalanced landings into something positive? Use these mistakes as a way to work on other aspects of your training. Every time you dont land perfect, give yourself a conditioning forfeit, say 10 pushups. If you are practicing rail precisions and you find yourself coming off a lot and not having a good day with with it, at least you will come away having worked on your strength at the same time, again bringing a positive from your mistakes. 2nd example – recovering from injury. Let’s say you have an arm injury. Clearly there’s not much upper body work or cat leap/vaulting movements you can work on. But is there anything wrong with your feet? or your legs? For a lot of people injury is seen as a hinderance, but again you can use it as an excuse to divert to other aspects of training. Of course you cant work on anything dangerous which might involve you using your arm in a fall, but low level balance, small jumps and leg conditioning can become the main focus of your training. I think when you are ready to start fully training again after an injury your weaknesses should only be related to the injury. No excuse to have lost leg strength from an arm injury, in fact if you keep with this ’empowerment through failure’ idea you should have stronger legs by the time your arm heals. So, the other aspect of this is is your recovery goes on and you start to move again. It’s important to remember that there are always endless solutions to any obstacle. You will have to start finding ways to get round using your arm, opening up many new techniques and forcing you to break down and rebuild techniques around the way that you now move as a result of your injury. Again, finding something positive from a previous failure. Hopefully this gives you something to think about, what im trying to say overall is that you must use every ‘negative’ experience to progress – find a lesson in every failure and dont forget – there is always something to train!